In the August 20, 2015 New York Times article, "Lessons Learned From A Disgraced Show," art critic Holland Cotter reflects on his visit to an exhibition as a young man. In 1969 he was uninitiated to the concerns of the art establishment—black or white—but about to discover the hold art would have on his sensibilities and career. He didn’t know what to make of the show. A major art museum summing up Harlem history and culture with huge, blown-up, black & white photographs seemed curiously like a scientific, ethnographic display to him, even then. But now Cotter understands why Harlem On My Mind was both a benchmark event and a cautionary tale in the history of American museums. 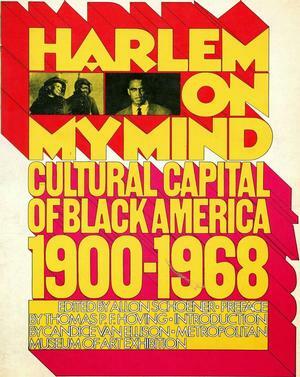 Harlem on My Mind, Cultural Capital of Black America, 1900-1968, which opened in January 1969 at The Metropolitan Museum of Art, is an exhibition that was infamous yet beneficial to its historical moment and beyond. Photo historian Deborah Willis recalls her experience of Harlem On My Mind as an aspiring photography student new to New York City in her book, Family, History Memory (2005). Unlike the protestors led by black artists who reviled the show, Willis says she felt great pride in the towering display of black figures such as Paul Robeson, Malcolm X and Madame Walker among images of average Harlemites. “I vividly recall walking through the exhibition wondering why protesters on the front steps were carrying placards saying, ‘Whitey Has Harlem on His Mind — We Have Africa On Our Mind’…. I wanted to discuss my pride in the exhibition openly with the people I met on the picket line but was afraid to do so because of their obvious discontent.” The protests were sparked by the Black Emergency Cultural Coalition of well-known black artists such as Benny Andrew, Romare Bearden and Norman Lewis. For all the oversights of the Harlem On My Mind exhibition, it did successfully achieve one of then Met director Tom Hoving’s key objectives—high traffic among black visitors. Deb Willis went back five times to view the show! She later came to understand the issues of exclusion that the Black Emergency Cultural Coalition was protesting. The issues: why would an art museum mount a show about African American culture that included no art? Why were no black artists or curators involved with organizing the exhibition? Why no black artists included in the exhibition? Why was the principal essay in the exhibition catalog by a 17-year old student? Why were no African American scholars involved in the research and writing of the catalog? Less than a year before (November 1968), the Whitney Museum’s exhibition, The 1930s: Painting and Sculpture in America had stirred public debate when African Americans protested that black artists had been excluded. The Whitney and Met protests forced everyone reckon with the fundamental cause of the outcry: the art establishment’s belief that the art and scholarship of African Americans had less merit than its own. 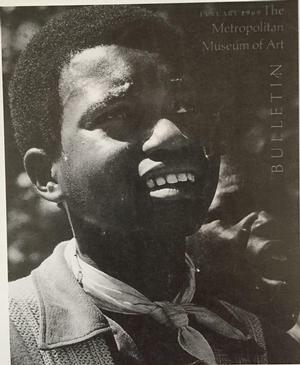 In the 1970s, mainstream art institutions would finally begin to recognize a handful of African American artists including Norman Lewis, Alma Thomas, Sam Gilliam and Romare Bearden and to tap an even smaller group of scholars and curators such as David Driskell, Edmund Barry Gaither and Lowery Sims to curate (or help curate) shows. The Whitney agreed to mount a major exhibition on the contributions of black artists which opened in its 1970-71 season. The discord between New York City museums and black artists during that era led to the formation of the Committee on Inclusion and Relevance by the American Association of Museums (AAM), now the American Alliance of Museums. The committee’s optimistic 1972 report, “Museums: Their New Audience,” made 15 recommendations to make museums more relevant to communities of people who normally don’t visit them. So where are we today on the AAM’s 1972 recommendations, and its 1998 "Museums and Community Initiative" and its 2004 "Museums and Diversity Initiative"? While there has been considerable improvement, the July 2015 Mellon Report shows how much remains to be done. How can museums "brilliantly" play a central role in the multiple lives of the nation? Brilliantly, for example, like the musical, Hamilton, is doing in its field? Big question! And one that the Brooklyn Museum figured out more than a decade ago with its shows based on contemporary urban culture or featuring academically-trained artists rooted in this culture. But what about other “brilliant” approaches — ones that can be applied to themes beyond urban contemporary culture? Art historian/museum educator John Welch has an answer to this question. In the IRAAA print journal article, “The American Museum as Active Instrument for Social Change” (IRAAA v. 21, n. 4, 2007), Welch said museums “should mount some exhibitions that community people can understand on a visceral level, moving from this beginning to other layers of understanding once people are home in the museum.” In other words: one key in diversifying and increasing museum staffing and visitation will be the recognition that connoisseurship is not beyond the ken of regular people. Indeed, all people have their own astute ways of identifying and appreciating artistry, originality and mastery. Yuha Jung's Harlem on My Mind: A Problematic Step toward Increasing Cultural Diversity?